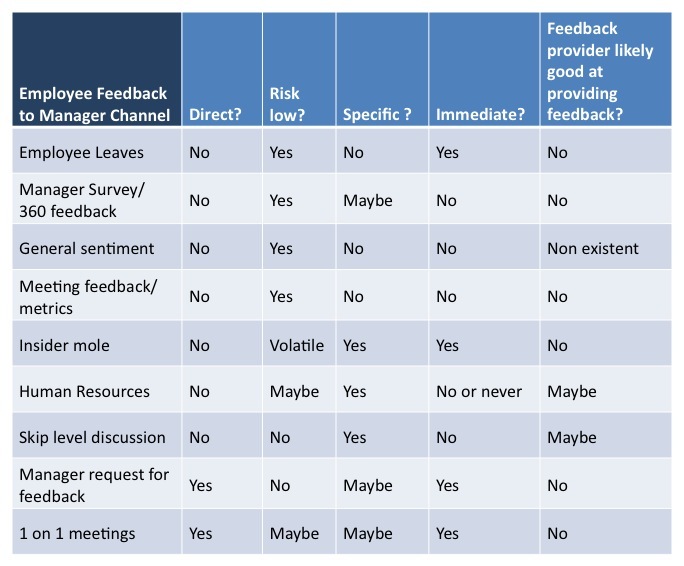 In none of these options do we see a realistic way for managers to obtain good feedback about what they are doing well and what they should be doing differently. They are left to their own devices to figure out what is working, or they have to rely on lagging indicators of team output, such as sales, budget variances, project outcomes, operational metrics, product quality, etc., that may or may not have something to do with how the manager performs as a manager. 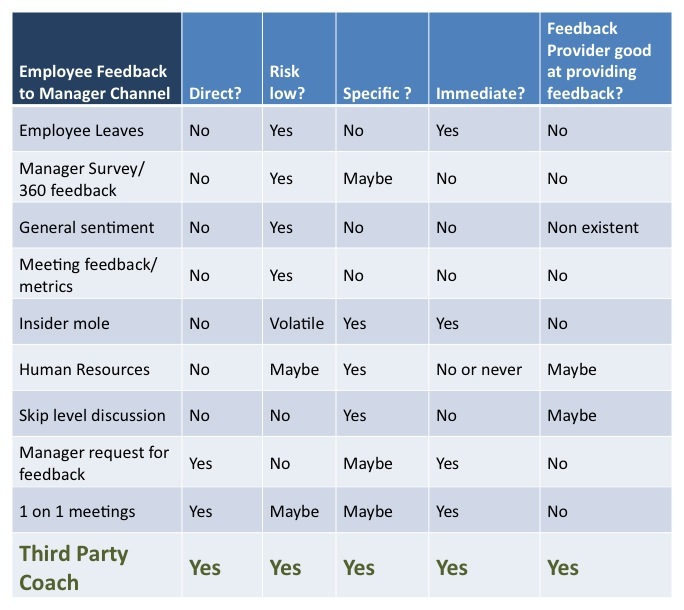 So this leaves one more option: Brining in a third party to assess and provide feedback to a manager. A manager coach. This third party entity could review the practices of the manager, interview the manager on how the manager operates as a manager, look at artifacts such as strategy documents, performance management documents, team meeting agendas, and the like, and even attend a few team meetings to review the manager’s practices. Interviews with employees are not necessarily required to be part of the process. Then, in a private session, the manager coach receives specific and immediate feedback on the expected practices of what a manager does in the organization, and is given the opportunity to improve. The manager could fill in the gaps in performance and identify opportunities to push his or her performance as a manager to higher levels. Full disclosure, the author of the Manager by Design blog, Walter Oelwein, provides this service via his consulting company, Business Performance Consulting, LLC. The “risk low?” column refers to the risk of a manager recriminating against an employee. Under the “Manager Coach” model, the feedback isn’t coming from the employee, but the coach, and the recriminations would be to the coach, if anyone. Additional benefits are that the feedback is provided regularly, based on the expected practices of a manager (either specific to the organization or general people management practices), the feedback is provided by someone specifically trained in giving feedback, and the feedback is pertinent to the actual current job performance. The down side? It costs money! Hiring someone to be a manager coach costs additional money, while the other feedback mechanisms listed above don’t cost anything. They’re free! What an organization needs to calculate is the what are the risks of having poor people management and benefits of having quality management. (Here’s an article discussing some of the macro costs of poor quality management.) Are your managers performing great as people and team managers? Do you assess this? Are they consistently meeting the performance bar for great team and people management? Are they avoiding the mistakes that managers tend to make? Are they employing solid practices that make for great manager? You make a good case for a ‘third party coach’!